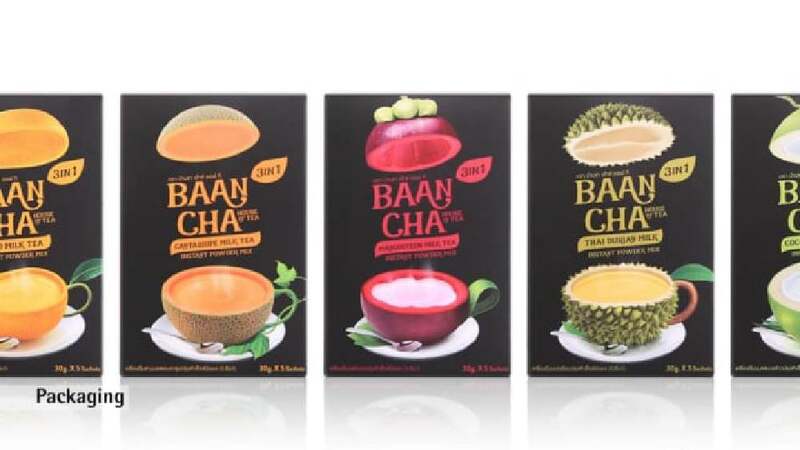 BAANCHA is a new brand specialised in instant tea which comes in five traditional and popular Thai fruit flavours, offering a genuine taste of Thailand, their country of origin. The products have a natural taste and aim at making consumers feel as if they were drinking straight from the fruit, evoking the notion of a natural and healthy beverage. The packaging captures this concept by creating a stunning visual of a half-sliced piece of fruit that is made to resemble a teacup. The five different fruits, among them coconut mango and cantaloupe, immediately appeal to the senses of consumers. Set against a plain black background, each of the bright-coloured fruits radiates its own self-sufficient appeal. The intention was to make the design stand out from other brands on supermarket shelves. These first five products are the beginning of a more extensive range of flavours to come. The design of the BAANCHA tea packaging excites with wonderful graphics. To cut the fruits of the individual flavours in half and represent the lower part as a teacup is a highly original and appropriate idea. It makes consumers understand the product immediately. In addition, the matte black of the packaging lends the simple instant tea a natural premium appearance.